There are two main settings in Blind-Date Baby: the London suburb of Vinehurst and the city of Paris. Vinehurst is based vary loosely on the south London suburb of Chislehurst. Although it’s part of Greater London, driving through parts of Chislehurst, you be mistaken for thinking that you were passing through a quaint English village. There’s a cricket pitch with a pavilion where men in whites play most Sundays in the summer, some wonderful Victorian architecture, a parish church with a lych gate and a common. Further afield is a high street with pubs and a pond. Chislehurst covers a much larger area that my fictional location of Vinehurst. It’s spread out over a few miles, but I wanted to create an even more ‘villagey’ feel, so I took the best bits, pulled them all together in one location and added a few features of my own, like a cobbled main street, which was based on Chislehurst's Royal Parade - a single row of shops away from the main High Street that is full of stylish boutiques and restaurants. This is where I could picture the coffee shop that Grace worked in, The Coffee Bean, being situated, as well as the Italian restaurant where Grace and Noah have their blind date. I have to add a disclaimer here! When I first write the book, this particular restaurant was in a totally different location in my mind - another part of London entirely - and was only as I was taking the pictures for this post that I remembered that there actually is an Italian restaurant on this stretch of shops. I just want to say that Barucci's was completely fictional and, having eaten at the restaurant on Royal Parade once, the staff are in no way snooty (as they were in my fictional establishment) and the food was delicious! Well, Paris needs no introduction, does it? The city of lights, the most romantic city in the world. A fabulous place to have a honeymoon - even if Grace and Noah's marriage is not exactly a traditional one. But I liked the idea of using this very romantic destination to highlight both the cracks in Grace and Noah's developing relationship and the potential it had to be something wonderful. 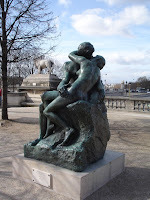 Well, I could write all day about Paris, but I decided it might be better to restrain myself to a few of the locations that feature prominently in the story. It was all Noah could do to get [Grace] off the street and in through the door. But she found the inside was just as fabulous, with an ornate curved counter, filled with works of art. Pink macaroons, stuffed with raspberries and topped with delicate flecks of silver leaf, pistachio bombes the colour of fresh green shoots with contrasting pink icing, éclairs, mille feuille, tartes… It was almost criminal that anyone should think of eating them. I queued for twenty minutes to get into Angelina, all the while salivating over the most amazing cakes and pastries I'd ever seen in a glass display case that was just inside the door. It was so hard to choose from all the delicious and colourful things on display. Mr Harper and I eventually made up our minds. 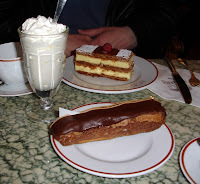 I had a chocolate choux eclair and he had mille feuille. 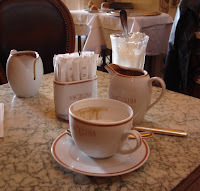 And we both had the wonderful bitter, thick, rich hot chocolate. I didn't understand why they served it with a glass of water until I'd had a few mouthfuls (the whipped cream, I got). But it was so rich, I needed to refresh my palate every now and then before I could go back for more. I can't talk about Paris here without mentioning the trees by the river, as they became such an integral part of the story. 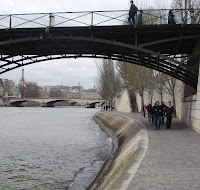 I visited Paris last March with my husband to celebrate my birthday and we took a walk along the wide grey stone quays line the river. We were just near the Louvre and along the quays were a line of silver birches. They looked kind of lonely in the cold March light, naked and shivering, and I’d bet they look spectacular in early summer, but without leaves to draw my attention, I noticed their trunks instead. 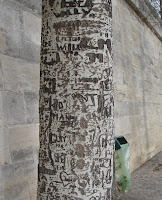 On every tree, on every available bit of bark there are carvings – the initials of lovers the world over who have come to Paris and sought a way to commemorate that moment forever. There were alphabets and characters in languages I couldn’t even recognise and I thought it was a wonderful little romantic detail. I took pictures of the trees, knowing that one day they would be perfect for a book. And when I decided to send the re-written, re-vamped Grace and Noah to Paris on their honeymoon, I knew I had to use them. I won't spoil the story for those that haven't read it, but I actually sobbed buckets writing the final scene with the trees. And I even made an editor cry, too - which is always a good sign!